The seating plan has been finalised and the tickets are getting ready to be posted. 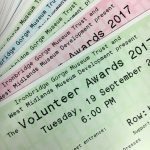 We can’t wait to see all of this years West Midlands Volunteer Awards finalists on the night! “In 2016 the team had the added challenge of a 1950’s allotment, an area dedicated to ‘grow your own’ that was connected to our summer exhibition. They were responsible for creating and planting up the plot and ensuring it was secure from pests. They also raided their own sheds to dress the allotment with gardening artefacts, such as galvanised buckets, watering cans and old tools.